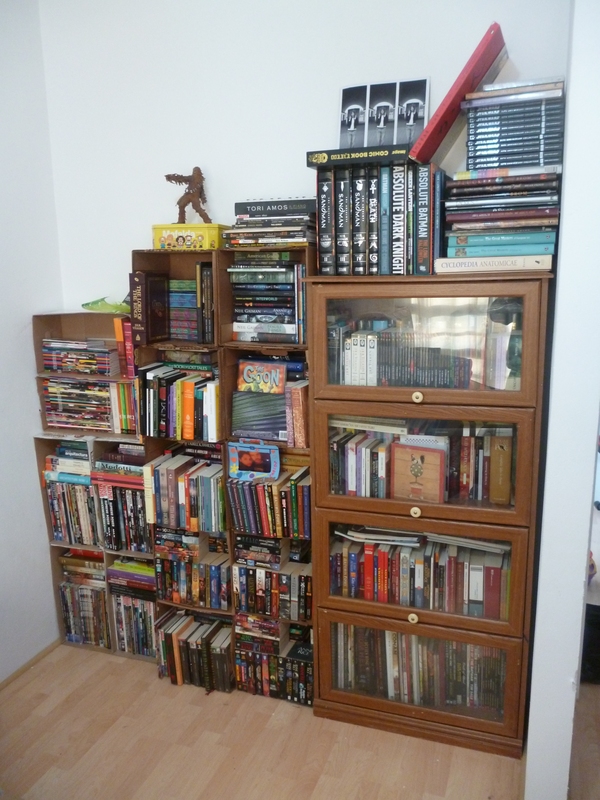 I finish unpacking all of the books and made some temporary shelfs from some cardboard boxes. This is basically everything I have bought in the last 6 years, most of it I have not yet read. Going throught all the books and organizing them I found the book which is my intention to read to reach 1,000,000 pages. It’s “American Gods” by Neil Gaiman, this particular edition is a paperback that was a birthday present from my beautiful wife some 7 years ago. So it went to the top shelf where it will need to wait for about 18 years. Well back to reading and planning a new project ECO.LECTORES more news coming soon. When I first decided to make the 50 book list for this year the idea of making progress with the very extensive bibliography of nobel prize winning author José Saramago was priority number one. The list contains five books, from which this two books are number three and number four. As always Saramago explores the hidden magical essence of even the simplest things. In “Manual de Pintura y Caligrafía” the stories follows the inner-thoughts of a mediocre painter. A rebel in heart living of making portrait for the social elite. Tired of painting worthless art, he focus on capturing his views on a journal with some beautiful calligraphy. In ” Todos los nombres” our story focus on a clerk of the Central Registry of Births, Marriages and Deaths who only things beside work is collecting clips from papers and magazines of famous people. One day going thru some files of this famous persons, by accident, takes a file of a regular person, a women . He becomes infatuated with this enigmatic woman and starts a journey to find out more about her. Two very different books exploring the same thematic of human obsession of finding something worth sacrificing yourself over. A collection of short stories by the nobel prize winning author José Saramago. With is particular humour and beautiful narrative the author makes us witness to the demise of a chair, a car worried by his next gasoline fix, a king tired of funeral processions, a rebellion of objects and even a centaur hidden in the woods of modernity. This book is perfect to read during a coffee break or lunch. It gives you the opportunity to escape reality for a little while as you dwell in the always enticing worlds and words of José Saramago. So that’s 5,071 pages down, 44,671 pages to go. I have been known for reading in very particular places. They become kind of sanctuaries where I can sit, relax and lose myself in a good book. With the drag of moving from our old apartment to our new house I wasn’t able to put together a decent spot for reading. Fortunately things around the house are finally beginning to take shape. And now I proud to say that the first reading spot of the house is ready. It’s located in the living room, the reading chair just arrived a few days ago and table was constructed from recycled materials and the rug gives it a warm and inviting feeling. The light from the dome in the stairs it’s perfect. In all it’s a very comfortable place to relax and drink a couple of cups of coffee. Well back to reading, almost done with the fifth book of this year.